Above: Alberto Garcia leads the fall protection awareness safety training program. On May 11, 2017, approximately 150+ building material trade workers participated in the 2017 Safety Stand‐Down awareness event at the American Buildings Company plant in Carson City, Nevada. Click here to read more about this success (PDF). Above: A volunteer helps demonstrate proper use of a Personal Fall Arrest System. As a company that takes safety seriously, UCOR has participated in the National Safety Stand‐Down for the last three years. In 2017, they reached approximately 1,500 employees on five different work sites, conducting a variety of activities over several days. Read the rest of this success story here (PDF). 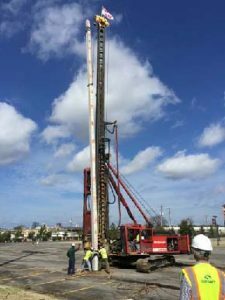 During its four years of participation in the Fall Prevention Stand‐Down, CORE Construction Services company has held stand‐downs at all its construction projects, including projects in Illinois, Florida, Louisiana, Indiana, Texas, Nevada, and Arizona. Click here to read more about this success (PDF). Milicia Electric Corporation participated in the 2017 Safety Stand‐Down by holding a 20 worker stand-down at a New York Power Plant project. 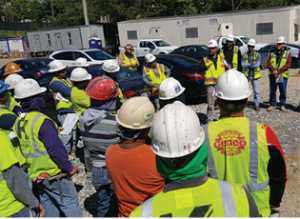 Safety Officer Robert Proimos led toolbox talks each of the five days of Stand‐Down week. Two talks focused on fall prevention, two on ladder safety, and one on respirable silica awareness. Click here to read more about this success (PDF). Builders Mutual partnered with NCDOL and Little Giant Ladders to take OSHA Stand-Down events to three job-sites in our footprint. The events included ladder, scaffolding and fall protection safety training. During the National Safety Stand-Down week, their RM consultants visited jobsites in 6 states, passing out Stand-Down Fall Protection flyers, croakies, and carpenter pencils. In 2017 they had nearly 200% more participants than 2016. Read more about the Builders Mutual Success here (PDF). Only a week or two before a planned Women Build event, Leslie Frazer of Habitat for Humanity of Lee and Hendry Counties, Inc. heard about the National Safety Stand‐Down and learned that it would be taking place during the same week. Seizing the opportunity to use an event that already garners attention and volunteers, Leslie quickly pulled together a plan to add Stand‐Down activities. During the week, ladder safety was wrapped into Toolbox Talks and safety meetings on six different job sites. Approximately 20 staff and 100 volunteers participated in these talks, received hardhat stickers, and learned how to utilize the NIOSH Ladder Safety App. In order to give the information long term relevance to volunteers who are not regularly working on construction sites, Habitat for Humanity (HFH) included lessons on safe ladder and step stool use at home as well. Click here to read more about this success. A volunteer helps demonstrate proper use of fall protection equipment. As part of the safety culture Webcor has created, they also participate in events such as Safety Week and the National Safety Stand‐Down. During this year’s Stand‐Down, Webcor’s jobsite in San Luis Obispo, CA participated for the full week, holding events for approximately 200 workers. 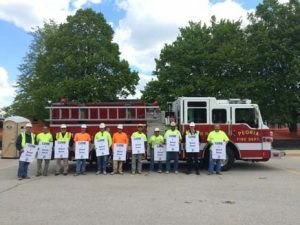 The activities conducted included safety talks, training, handing out Hazard Alert cards and hardhat stickers, and a stopconstructionfalls.com carabiner give‐away. Webcor even printed their own banner, which hung at the jobsite for the week leading up to the Stand‐Down. Representatives from several equipment rental companies and manufacturers like Werner Ladders and Guardian Fall Protection were present to review proper use of ladders, scaffolds, scissor lifts, boom lifts , and personal fall arrest systems. Webcor also used this opportunity to remind workers of their policies—such as a mandatory 6 foot rule for protection and rescue plans for all work involving fall hazards. Click here to learn more about the Webcor stand-down. The company has participated in the fall prevention Stand‐Down for all four years, and this year decided to expand it to all seven of its active project sites. The events engaged the employees of Contract Construction and 35 sub‐contractors, reaching a total of more than 200 workers. The seven stand‐downs were tailored to each job site by addressing the fall hazards occurring at the stage of construction present at the time. 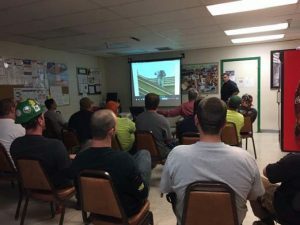 All job sites discussed general fall protection while working at height, and others discussed slip, trip and fall hazards occurring on the same level. Several job sites discussed falls from heavy construction equipment such as dump trucks, excavators and mobile cranes. Click here to read more about Contract Construction’s stand-down events. 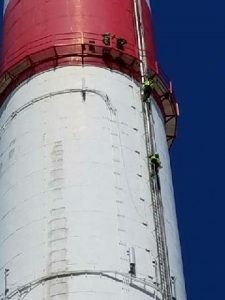 Brock Services, a contractor who provides construction and maintenance services, including scaffolding, painting, insulation, shoring, lead and asbestos abatement, and fireproofing, participated in a fall prevention stand down at a urea production project near Beulah, North Dakota. Brock’s 120 employees joined other contractors at the site for an 800 person stand‐down. Click here to read more about the Brock Services stand-down in North Dakota. 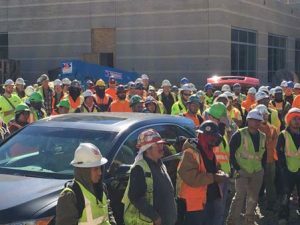 TA Loving and sub‐contractor workers attend a stand‐down at a hospital construction project in Greenville, North Carolina. TA Loving Company participated in the 2017 Safety Stand‐Down awareness event by holding stand‐downs at all 23 of its projects. TA Loving is a general contractor based in the Raleigh/Greenville area of North Carolina. 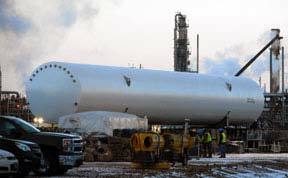 The company performs a wide variety of construction, including hospitals, bridges, schools, utilities, and public infrastructure such as waste water treatment plants. This is the fourth year TA Loving has participated in the nation‐wide fall prevention Stand‐Down. Click here to read more about the TA Loving Company stand-down. Each year the U.S. Air Force promotes an extensive Fall Prevention Focus in an effort to remind and educate all Airmen on fall prevention and risks associated with working at heights. The goal is to reduce the number of fall-related mishaps both on and off-duty. Building on past successes, the 2017 Fall Prevention Focus was expanded to include falls on the same level and ladder safety. This year’s AF Fall Prevention Focus was held 8-19 May, 2017, in conjunction with Occupational Safety and Health Administration (OSHA) National Safety Stand-Down week. The Focus encompassed the entire Air Force family, to include Active Duty, Air National Guard, Air Force Reserve, civilians, contractors, family members and was designed to be very simple. Airmen were encouraged to take a brief break during their work day to discuss fall prevention measures, equipment and policies with their supervisors. Air Force Safety Center (AFSEC) Occupational Safety also partnered with the National Institute for Occupational Safety and Health (NIOSH), further highlighting the Air Force fall prevention efforts. Read more about the USAF Stand-Down here. If you put on a successful Stand-Down and would like us to publish your story, let us know here. For more Success Stories from past Stand-Downs, click here. For more detailed data analysis on the National Safety Stand-Down check out our 2014 & 2015 report and the 2016 supplement.